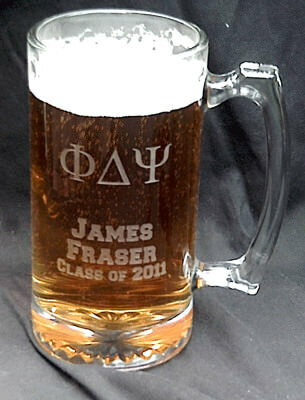 We can use all Greek letters, so you can have your fraternity, sorority, college, university or professional organization's letters on any of our glassware for no extra charge. The Greek letters will only count as one line of text, so you can put anything you like on the other lines (number of lines varies by glass). As always, the less text and/or design you want, the bigger it will be. All our products are sandblasted, not screen printed, so the design will never fade or come off. We can also use logos or crests, see our Custom Design Instructions page for more information. When ordering, please use the English names for the letters and note that you want the Greek. For example, the above mug's instructions would be"Phi Alpha Psi, please use Greek letters". As always, if you have any questions, please feel free to Email Us or call or text (815) 964-2080 8:00 am to 4:00 pm CST, Monday to Friday.